Usher treated his boys to a trip to the Balloon Saloon in Manhattan over the weekend. 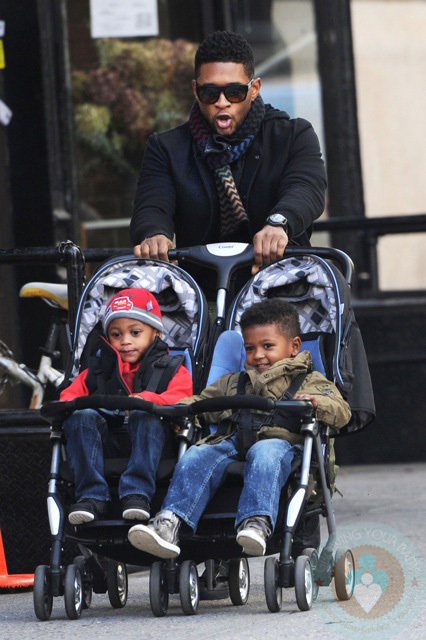 The singer was spotted pushing Usher Raymond V, 3 and Naviyd, 2 down the street before heading into the store where the boys left with new toys and big smiles! Could the out be an early birthday celebration? Usher Raymond V turns 4 this Saturday, but it’s not clear if he will be with his mom for the weekend, the singer’s ex-wife Tameka Foster. Usher pushes a Combi twin sport in Indigo. Oh my! They are SO cute.